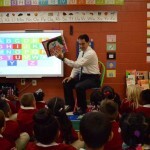 MADISON (WORT) — Wisconsin Governor Scott Walker’s aggressive stance against organized labor first gained him national attention only a few months into office in 2011. 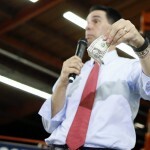 His infamous Act 10 took away collective bargaining rights for thousands of public employees in Wisconsin and prompted months of historic protests at the State Capitol. In the first few months of his second term as Governor, Walker signed right-to-work legislation into law, which weakened private sector unions in the state. Walker didn’t campaign on this reforms during his gubernatorial races but he’s taking a different tack now that he’s running for president. During a campaign speech in Las Vegas Monday, Walker pledged to eliminate federal employee unions and to push for right-to-work legislation in every state. He also called for the the National Labor Relations Board to be dismantled. It’s too soon to tell whether Walker’s labor platform will bring him back to the top of the pack of GOP presidential contenders. 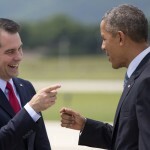 Walker was the candidate to beat in Iowa just weeks ago. 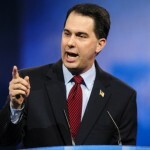 The latest poll from Quinnipiac University poll shows support for Walker at 3 percent among likely caucus-goers in Iowa. Dylan Brogan reports.